By deploying hundreds of unique deception tripwires, IllusionBLACK maximises attack detection through the kill–chain, even against stealthy, targeted campaigns that don’t involve malware. IllusionBLACK features rapid out–of–band deployment, no performance impact, enterprise scalability, and minimal false positives, leading to faster breach detection and improved security and incident response team productivity. From targeted threat intelligence of an impending attack, to detecting lateral movement in every single subnet, Smokescreen’s deception technology helps turn the tables on apex attackers. 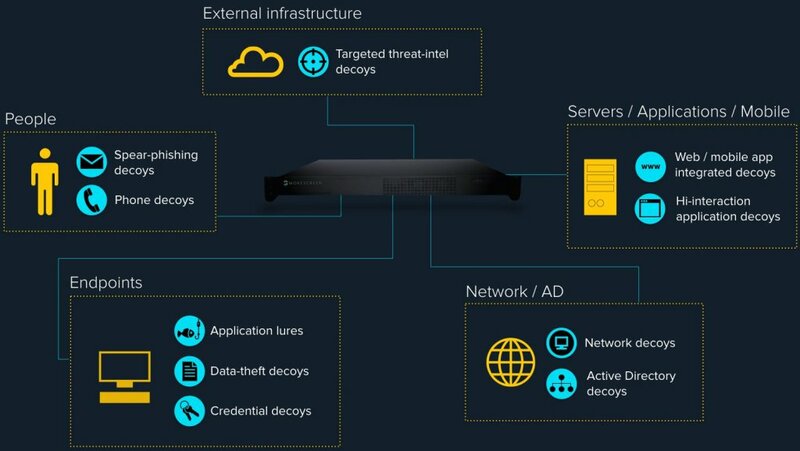 Full Kill-Chain Coverage - IllusionBLACK decoys detect pre-attack reconnaissance, spear-phishing attacks, privilege escalation, lateral movement and data-theft. Deep Network Visibility - Instantly deploy 100’s of individually unique, customisable traps across all your endpoints and in every single subnet of your network. Attack Vector Agnostic - Deception does not rely on static signatures or heuristics to identify attacks, so it stays effective no matter what the bad guys try tomorrow. MirageMaker™ - Realistic auto–created decoy data fills deceptive assets with always unique, instantly changing content. WebDeflect™ - Integrate deception into any web or mobile application to guard against business logic attacks. Smart Integrations™ - Logic–driven automatic response and orchestration to execute response strategies at wire–speed. ThreatParse™ - Natural language attack reconstruction parses raw attack data into plain English attack analysis. ThreatDeflect™ - Redirect attacks to decoy cloud environments to keep attackers engaged while containment kicks in. Hardened BSD UNIX base™ - Rock–solid security built for highly–targeted environments, coupled with BSD UNIX’s legendary reliability. Automated triage™ - Agentless investigation of compromised endpoints to reduce root cause analysis time and capture volatile forensic information. Forensic preservation™ - All evidence recorded and preserved for further analysis in industry standard formats. Threat intelligence export™ - Machine consumable through STIX, JSON and CSV, as well as integrations with other security infrastructure.